Iranians Go To Polls In Vote To Replace Ahmadinejad : The Two-Way Six candidates vie to replace the combative president, all but one of whom are hard-liners favored by the country's ruling Islamic clerics. Ali Akbar Velayati, a conservative presidential candidate, shows his ink-stained finger as he votes at a polling station on Friday. 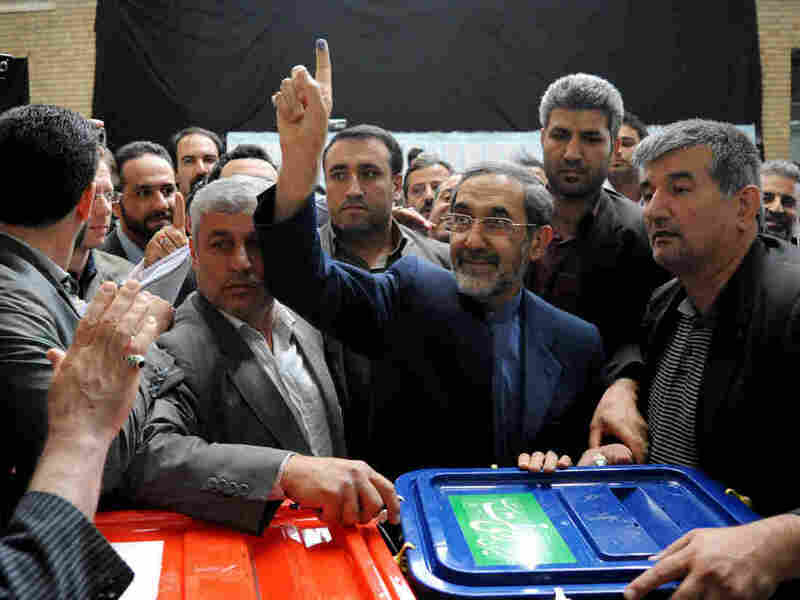 Millions of Iranians cast ballots Friday in elections to replace incumbent President Mahmoud Ahmadinejad, a race that is being characterized as a potential challenge to the country's ruling Islamic clerics. A slate of conservatives tacitly backed by Supreme Leader Ayatollah Ali Khamenei are facing off against the lone moderate, Hasan Rowhan, a former nuclear negotiator. Other candidates include Saeed Jalili, also a nuclear negotiator; Tehran Mayor Mohammad Bagher Qalibaf; and Khamenei's diplomatic adviser, Ali Akbar Velayati. Although the president in Iran has little say in the country's most substantive issues, long lines at polling stations in Tehran and elsewhere suggest enthusiasm for an election that was once viewed as a pre-engineered victory for Iran's ruling establishment, The Associated Press reports. Khamenei, casting his ballot on Friday, took the opportunity to lash out at the United States after Secretary of State John Kerry last month questioned the credibility of the poll. "Recently I have heard that a U.S. security official has said they do not accept this election," the cleric was quoted by state TV as saying. "OK, the hell with you." "A victory by Rowhani would be seen as a small setback for Iran's Islamic establishment, but not the type of overwhelming challenge posed four years ago by the reformist Green Movement, which was brutally crushed after mass protests claiming Ahmadinejad's 2009 re-election was the result of systematic fraud in the vote counting." "The Guardian Council, a state body that vets all candidates, barred several hopefuls, notably former President Akbar Hashemi Rafsanjani, one of the Islamic Republic's founding fathers seen as sympathetic to reform, as well as Ahmadinejad's close ally Esfandiar Rahim Mashaie." Rasool Nafisi, an Iranian affairs analyst at Strayer University in Virginia, tells the AP that "Rafsanjani was really the only choice to re-energize reformists." He adds, "Rowhani only got their support because he is seen as Rafsanjani's man and a vote for Rowhani was a vote for Rafsanjani." NPR's Steve Inskeep, reporting from Tehran, says that although many independent newspapers have been shut down over the years, "this is a season, however brief, when ordinary Iranians on the streets just explode with opinions." The Interior Ministry announced that voting, initially due to end at 1:30 p.m. GMT, would be extended by several hours, Iran's Press TV reported in mid-afternoon, according to Reuters. The AP reports heavy turnout that had officials extend the polling by several hours. It said the turnout could favor reformers because it suggests "liberals and others abandoned a planned boycott as the election evolved into a showdown across the Islamic Republic's political divide."